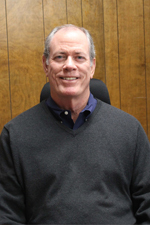 Mr. McGovern is a native Tucsonan and a graduate of the University of Arizona (B.S.B.A. 1975). He is a key employee at Turner Laboratories, Inc. and manages the financial and accounting aspects of the business. He was previously the chief financial officer for a large mechanical contractor in Tucson. As President, Mr. McGovern is responsible for all administrative functions and corporate direction of Turner Laboratories, Inc.
Factoid: Rarely does a day go by that I don't swing a golf club and I'm still awful. Ms. Garcia oversees the day-to-day laboratory activities including validation of analytical data, monitoring of quality control practices, ensuring that established and approved procedures are followed and that laboratory personnel are properly trained, as well as implementing new equipment and technologies. She is a graduate of the University of Arizona with a Bachelor of Science degree in Chemistry. She performed the duties of analyst for five years in Turner Laboratories' organic chemistry department followed by one year as Quality Assurance Officer. Factoid: Likes hiking desert paths with husband and trailblazing cattledog, Buckaroo. Ms. Weyer's responsibilities revolve around Turner Laboratory's clients. 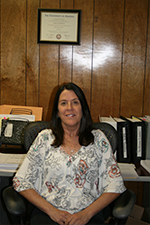 She ensures that all reports are delivered in a timely manner, answers questions regarding laboratory results, and keeps up to date on new regulations affecting our clients. Ms. Weyer reviews projects, permits and time lines to ensure accuracy. As safety officer, it is her responsibility to maintain safety logs and test safety equipment on a regular basis. She is also key in maintaining Turner Laboratories database. 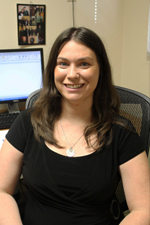 Ms. Weyer is a graduate of Iowa State University with a Bachelor of Science degree in Animal Ecology from The Natural Resources, Ecology and Management Department. Factoid: In my spare time I practice pioneer crafts; spinning wool, soap making, and wood working. Mr. DiCenzo has been employed with Turner Laboratories for over 20 years. He holds the position of Senior Chemist in the inorganic chemistry department. He oversees the metals preparation area and operates instruments including inductively coupled plasma mass spectrometer and optical emission spectrometer, graphite furnace atomic absorption spectrometer, cold vapor atomic absorption spectrometer, and total organic carbon analyzer. Prior to joining Turner Laboratories, Mr. DiCenzo worked in the plating and metals industry. 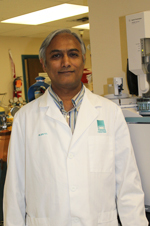 Mr. Patel has been employed with Turner Laboratories for over 24 years. He is the senior chemist in the organic chemistry department. He manages the volatile organics area and operates three purge and trap gas chromatograph/mass spectrometers. He is a graduate of Gujarat University with a Bachelor of Science degree in Chemistry. Factoid: Loves reading, gardening, cricket, golf, and listening to indian classical music. Mr. Rivera serves as Turner Laboratories field sampler. 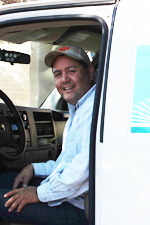 He is responsible for coordinating sample pickup all over the greater Tucson area. He is proficient in collecting composite and grab samples and provides flow monitoring services as well as basic field testing analysis. Mr. Rivera has also attained a 40-hour Hazwoper Certification that is refreshed annually. Factoid: My hobbies include sports, working out, hunting, fishing, team ropeing, and of course walking my little doggy. 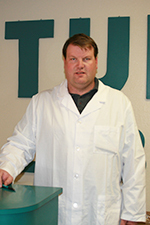 Kevin serves Turner Laboratories Inc. as sample control officer. He is responsible for logging samples, preparing bottle kits, as well as shipping and receiving samples. Kevin also aids the safety officer in sorting hazardous materials as safety officer in training. Kevin graduated from Northern Arizona University with a Bachelor of Science degree in the field of Forestry and Wildlife Management he has had over seven years experience working within the environmental lab setting before joining our staff at Turner Laboratories Inc. in 2013. Factoid: Kevin enjoys hiking, golf, mountain biking, fishing, and snowboarding. Mr. DiSante is our semivolatile organics analyst. He is a graduate of the University of Arizona with a Bachelor of Science degree in Chemistry and a Minor in Soil and Water Sciences. 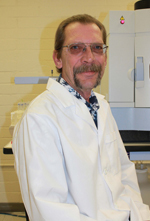 He operates four gas chromatographs with ECD, FID, and MS detectors and has contributed to the development of new sample preparation techniques. 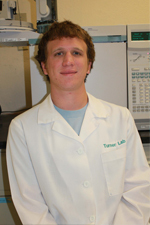 Prior to coming to Turner Laboratories, he spent three years performing undergraduate research with LCMS/MS and GCMS/MS.